The African Development Bank is an amazing turnaround story. The regional development bank was close to shutting down after losing its AAA credit rating in 1995 and, worse, squandering the confidence of its shareholders. Omar Kabbaj became Bank President that same year and tightened controls to regain AAA status, but the AfDB had yet to show it could be a real leader in development. To make matters worse, Cote d’Ivoire erupted into civil war in 2002 forcing the Bank to flee to temporary headquarters in Tunisia. Into this precarious situation stepped Donald Kaberuka, a quiet-yet-highly-effective finance minister from Rwanda who was elected AfDB President in 2005. The following year, CGD launched a working group to make recommendations to both management and shareholders how to “put the Bank back on the road to success and to maximize its ability to contribute toward Africa’s development.” In 2010, we re-assessed progress, giving the Bank itself very high marks and urging the shareholders to step up. Today it seems clear that Kaberuka has made massive strides in focusing the Bank’s lending on its core business of infrastructure and, perhaps just as importantly, positioning the AfDB as a global player beyond its portfolio. It played a key role in protecting Africa from the effects of the 2008-09 financial crisis, advocates forcefully for the region’s interests at the G20 and other fora, and promotes Africa as an investment destination. The next twelve months, however, are critical. Moving HQ again. Beginning last March, Bank staff began moving back to Abidjan. This presents many logistical and recruiting challenges that will need to be worked through. But it also makes the Bank vulnerable again to local political risk. Cote d’Ivoire looks stable again, but another emergency move would be a huge blow to the Bank’s recovery. After Kaberuka? 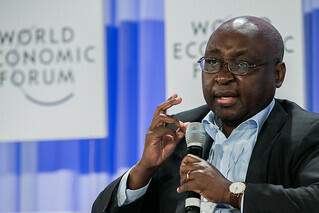 An even bigger question is who will replace Donald Kaberuka when his final term ends September 1st, 2015. The flipside of having an inspiring and capable leader of a historically weak organization is that the institution can become reliant on that person. This puts a premium on selecting the absolutely best person to take over—and one who can continue to consolidate all of the progress over the past decade. The onus now falls squarely on the shareholders. A formal process has already begun to nominate candidates, a final list will be released in January, and voting will be completed at the annual meetings in May. The 53 regional shareholders are already horse-trading behind the scenes for support for their preferred candidates. The 25 non-regional shareholders (especially the large ones like the US, France, UK, Japan, and Germany) can also play a constructive role by actively and rigorously evaluating all the candidates and then working to encourage only the very best one to win. CGD will play a small role too by providing a forum for the main candidates to explain their vision for the AfDB, as we did for the EBRD, the World Bank, and the World Trade Organization. Watch this space.